This is a community tapestry and story-telling project guided by artist Silvina Der Meguerditchian. A three day art-making, crocheting and story-telling workshop led by Berlin-based artist Silvina Der Meguerditchian. Participants will weave a collective tapestry composed of their family photographs, objects and memories. The resulting carpet of this community project will be featured in the upcoming exhibition “Nonlinear Histories: Transgenerational Memory of Trauma” set to open on Saturday March 17, 2018. Participants are asked to bring old family photographs, memoirs, religious objects, household items of all kinds (everything from dowry items to cooking utensils), and other material inherited from their ancestors. All photographs and objects will be digitized (photographed or scanned), printed and then laminated. 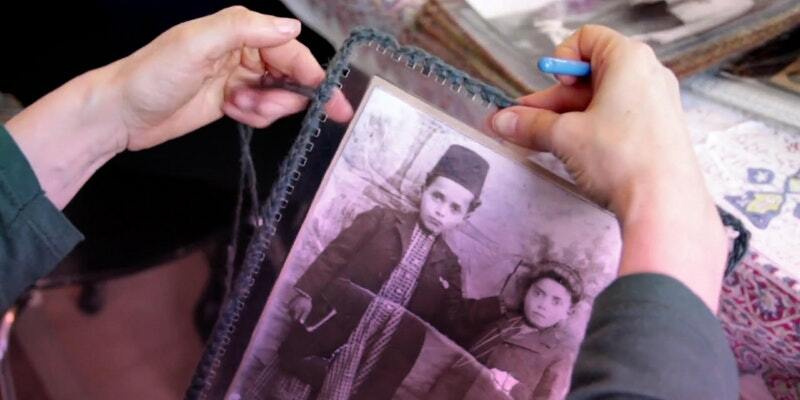 Participants then will work together to weave a collective carpet with these images and wool while sharing their family memories and histories. By sharing your family archives and family micro-histories, you are helping to reconstruct the life of all our ancestors. All items will be returned immediately after digitization. The workshop is free but pre-registration is required. Workshop will take place at the MakerSpace at Downtown Central Library. You may register for the 2 pm or 4 pm time slots and as many times as you like. There is a total of 6 workshops to register. First come, first served. Space is limited. Visitors to the Downtown Central Library receive 3 hours FREE parking across Harvard Street at the Marketplace parking structure with validation at the service desk. Handicapped parking is available on the east side of the building. Short term parking spaces are available on the east and south sides of the building. Metered parking is available on Harvard Street and on the west side of the building in Lot #10.